I use Electric Quilt software to design almost every quilt I make. A benefit of EQ (version 7, in my case), is that I can easily play with block colorings, auditioning color/value/fabric ideas before I start cutting and sewing. 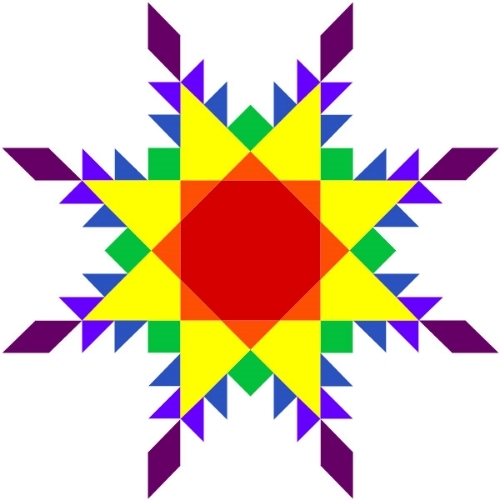 I wanted to see what a color-order feathered star would look like, so I created the image above. I think it's a winner! Now to actually sew it... but, you know? I'd be just as satisfied seeing someone else create it. ;) If you haven't received your free pattern for the No Y Seam Feathered Star block, get it here. The process of coming up with additional color scheme ideas led me to create a simple, one-page PDF of the plain block, available for you to download. Print it, color your own to audition color and placement of your fabrics. There are so many opportunities to go "off pattern" here and be free with color! Click image for the PDF download. It's just another tool - not necessary - but fun and possibly helpful. I've absolutely loved seeing the NYSFS blocks that are starting to hit Instagram - check out the hashtag #noyseamfeatheredstar to see for yourself the magic being created! You are also invited to join the Friends of Threaded Quilting Studio closed Facebook group for more examples and ideas. Just click to join and I'll make sure you get added.